I’m a big fan of RPG’s and I’ve played many over the years. But, I am a newbie when it comes to the action/beat-em-up RPG genre. I like fighting games, but I’ve never been good at them. Learning combos take time, practice and patience; three things I don’t have much of while playing video games. I’ve never a big fan of beat-em-up action games like God of War or Devil May Cry. But, I liked Dragon’s Crown. I liked it for one simple reason: it’s really fun. Vanillaware developed Dragon’s Crown. If you’re familiar with this very talented development studio, you know that it isn’t surprising that Dragon’s Crown packs stunning hand-drawn visuals. If you’ve never heard of Vanillaware, well now you have. Dragon Crown’s color palette is something fit for a king. Very vibrant pastels are used on every inch of this gem. The over-stylized character models are right at home, even if over-sexualized. This is a Japanese-inspired RPG. No one should be shocked that the Sorceress looks the way she does. This game is gorgeously groomed from head to toe. I can’t even begin to fathom how many hours were put into painstakingly hand draw every little animation in the game. But, my eyes are ever grateful for Vanillaware’s patient talent. Words really can’t do the presentation of this game justice. Just go buy it! It is in the gameplay department where Dragon’s Crown hits a homerun on it’s first pitch in it’s first at-bat. But, Dragon’s Crown unfortunately strikes out on it’s next time up to the plate. Not a baseball fan? Okay, let me go into full detail to explain. Dragon’s Crown has 6 unique character classes: Fighter, Wizard, Sorceress, Dwarf, Elf and Amazon. Choosing a character is a built-in difficulty level. Playing as the Sorceress is recommended for expert players, while playing as the Fighter is recommended for beginners. The character selection breaks down each character’s difficulty level. This is a very cool feature right off the top. 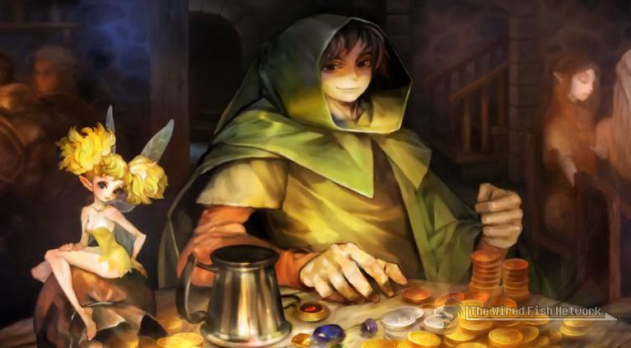 In true RPG form, leveling up and collecting loot are at the cornerstone of gameplay in Dragon’s Crown. Leveling up is straight forward: you get experience points based off of how successfully you defeat enemies and clear levels. But, there’s a deeper caveat. You don’t have to travel back to the hub town once you complete a level. You can earn a higher experience multiplier by moving through to the next level. Keep in mind, you and your teammates will not regain any health, items, or anything else you’ve lost. Yes, this includes loot. It’s one heck of a risk/reward system. A very clever gameplay design choice that undoubtedly adds depth. You will find chests full of loot that are graded from E to S. E being the lowest rarity grade and S being the highest rarity for loot. Your NPC companion, Rannie, will collect coins and open said loot chests for you throughout your journey. But, in true Dragon’s Crown form, there’s a catch. And this catch might be what makes the game for me. You don’t know what you received when it comes to your collected loot. All you know is the grade of it. So, when you venture back to the hub town you can get your stash of loot appraised but it’s going to cost you a pretty penny. So, do you appraise your loot to see what items you got or do you sell your loot blind, without even knowing if it is the rarest item in the game? The choice is yours. Every time you level up, you earn a skill point. These can be used to upgrade your character. If you’ve ever played an RPG before, this should be straight forward. Think Borderlands here. Each character has a specific set of skills you can upgrade/unlock. Then there are common cards all characters can share when it comes to skill points. Those being stats like increased health, defense, etc. 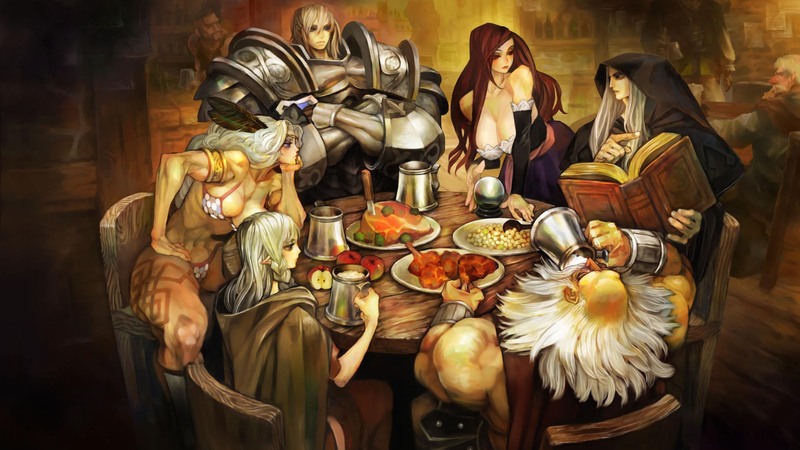 Like Borderlands, you can play Dragon’s Crown online or locally with your friends. This game is meant to play with others. If your friend’s don’t own Dragon’s Crown or if you don’t have three extra controllers, don’t fret. You will stumble upon numerous NPC’s in the game. Use them! It’s how the game is supposed to be played; four characters on the screen at all times. In a beat-em-up RPG like this, playing with your friends means hours upon hours of addictively fun gameplay. The combat is satisfying, especially when you shake it up. There aren’t combos, per say, but you will quickly learn what moves to use in succession in order to be successful. Dragon’s Crown is NOT an easy game. It’s this challenge, the uniqueness of its characters, and it’s immensely fun way to play with your friends that make it’s gameplay second to none. Dragon’s Crown is very satisfying. Dragon’s Crown is very polished, deep and refined. Dragon’s Crown is fun! Gameplay is king when it comes to video games. It’s no surprise that this Dragon’s Crown is made out of 24-karat gameplay. The narrator really shines in telling an old medieval-like tale of knight and dragon proportions. Well, at least from the start. About five hours into the story, you quickly pick-up on the fact that the narrator is saying the exact same thing every single time you travel to a vista you’ve been to a million times before. Luckily, you can mute the narrator in the options. Yes, you travel to the same places a million times. This is a thing, too. There are only 9 unique worlds to play through. And then there is a hub town where you can do everything from outfitting your character to resurrecting fallen players. As I’ve stated above, there are too many enemy types to count; every one of them unique. This helps playing the same levels over and over again, a bit more doable. So does the fact that enemies scale to your level. But, for someone who hates doing the same thing twice, this game will get very repetitive, very quickly. Playing with friends is a blast! Again, the gameplay is really fun and rewarding, BUT too much of a good thing can be bad. You spend the first several hours, essentially doing carrier missions, learning the intricacies of the game. This is fine, but this is all story-related. You will quickly realize that the story feels cumbersome a it takes away from the stellar and insanely fun Dragon’s Crown gameplay. This is a very peculiar situation that I have never really stumbled on in a game, before. It is so strange to say that Dragon’s Crown would be better off without it’s story. But it would. The story takes you out of what makes Dragon’s Crown so good…and way too often. Especially during the first half of the game. For what it’s worth, on harder difficulties you skip the monotonous beginnings of the game. So there’s that. This is very much a nit-pick. But, I feel like I have to mention it anyway. 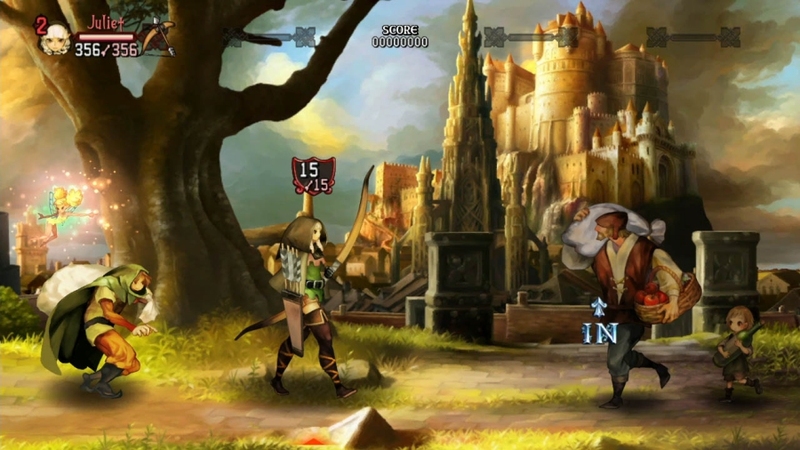 Dragon’s Crown is a 2D side-scrolling game. But, the screen has depth to it. Think LittleBigPlanet, if you’ve ever had the pleasure of playing as a Sackthing. I played as the Elf on my main playthrough. What makes her unique is her bow. She can shoot arrows at enemies from across the screen. In fact, Elf players are rewarded (and most effective) staying far from the action. This is where screen depth on the 2D plane becomes incredibly frustrating. So many times you feel like you’ve got an enemy lined up from across the screen. You fire the arrow and miss because the enemy isn’t actually on the same line as you are. This happens with up close melee moves, as well. But, it is more pronounced while fighting from afar. Many of my colleagues were trying to get me to tip my hat for what score I was going to give Dragon’s Crown, well before I finished the game. I wouldn’t budge. But, I told them one thing: it’s really fun. And really, what more do we want in a video game? -Can The Narrator Shut Up Already? *Dragon’s Crown is a PS3/PS Vita exclusive. I only played the PS3 copy of the game. I recommend the bigger screen for playing this game. Battle scenes get very clustered and chaotic. Anyways, Dragon’s Crown is NOT a cross-buy or cross-play game, but it is cross-save. Meaning you have to buy both versions separately if you want both the PS3 and Vita versions. Also, Vita players cannot play online co-op with PS3 players, but you can carry your game saves back and forth between PS3 and Vita. So, as you can imagine, there is only one trophy list and hence only one platinum trophy. No double plats, sorry guys! What’s up All-Stars?! It’s just Kyle and Ryan holding down the fort this week, with Nooch being his pretty boy self, basking in the California sun for a week. Kyle and Ryan tackle the depressing PS All-Stars news, the joyous Tomb Raider news, and even talk about possible Game Of The Year candidates. Also, Kyle let’s the listeners behind the curtain a bit, and talks about how his review of Dragon’s Crown is coming along. Kyle surprises everyone with a Guacamelee! review, while Ryan talks up Metro: Last Light. Did we even mention Gamescom and the possible PS4 and Xbox One release dates? We sure did! It’s a great show! PI! You can listen to the show here.